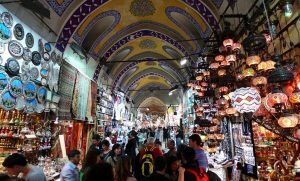 One of the magnificent parts of Istanbul is still the Grand Bazzar in Eminonu. Despite being saturated with tourists and thus, certain trades being diluted by novelty souvenirs, the bazaar resiliently and defiantly has not lost its enchanting air. The Spice market or “misir carsisi”, meaning the Egyptian Bazaar (aptly named for its trading on the silk Route), never fails to capture my imagination, with the hypnotizing smells and vivid colours that paint the beautiful stone arches. Still the centre for spice trade in Istanbul and has been for 350, it’s a place I love to visit to draw inspiration. It’s the closest I will ever get to feeling like Indiana Jones; exploring and always managing to find something I’ve never encountered before.